The New York Police Department officer caught on tape apparently stomping on a subdued suspect has been indicted by a grand jury on a misdemeanor charge of assault. The grand jury only considered the misdemeanor charge, which carries up to a year in jail. Officer Joel Edouard, 36, appeared in Brooklyn Supreme Court on Tuesday and pleaded not guilty to a misdemeanor charge and an official misconduct charge, according to NBC. The incident happened during an arrest in Brooklyn on July 23, last year, when police on patrol saw the suspect, Jahmiel Cuffee, allegedly rolling a joint outside a residential building, which he then threw away when he saw authorities. Cuffee showed police his ID but, when they attempted to place him under arrest, he allegedly resisted and the officers struggled to take him down. In the amateur video caught by a bystander, you can hear Cuffee plead “help me!” as several cops hold him down. Edouard can be seen briefly pulling out a gun, then putting it back in his holster. He walks away, returns and appears to kick Cuffee in the head, prompting another cop to push him away and the crowd to gasp. Cuffee, who suffered scrapes and bumps, was charged with attempting to tamper with evidence, obstructing governmental administration and resisting arrest. The charges were eventually dropped, and Officer Edouard was placed on modified desk duty in July. The incident was investigated by the Internal Affairs Bureau. Edouard's attorney said his client had been trying to handcuff the suspect, who allegedly had been drinking on the sidewalk and had marijuana on him, and that this was nothing more than a case of an officer doing his job. 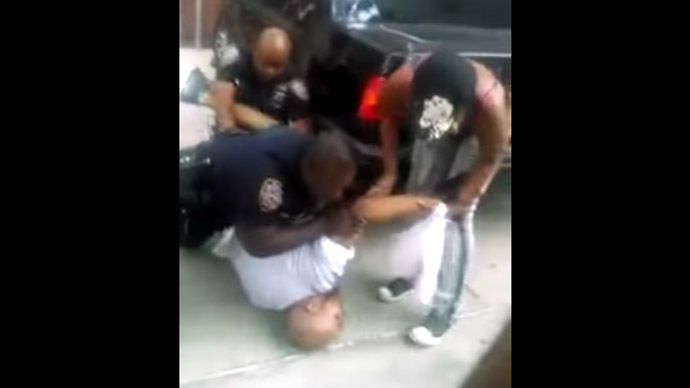 The alleged stomping came less than a week after the July 17 chokehold death of Eric Garner in Staten Island. Garner’s arrest was also captured on amateur video, prompting protests around the city. Edouard is the third NYPD police officer charged by the Brooklyn DA’s Office since November, when two cops were indicted by a grand jury for chasing down a teen and allegedly hitting him in the face with a gun. This would be “the third cop indicted by the Brooklyn District Attorney’s office in the last three months because of assaults caught on video – demonstrating once again that cellphones are still the best protection civilians have against police over-aggression, at least to demonstrate these brutal acts are taking place,” wrote Nick Chiles in the Atlanta Black Star.